TBILISI, DFWatch–Georgia looked set to continue growing its export this year, but a 35% drop in November has brought the export down to same level as 2013, according to new preliminary data from the National Statistics Department. 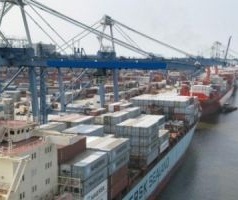 Georgia’s export in the month of November was USD 203 million, compared to USD 312 million in 2013. When this dramatic drop is incorporated into the year-so-far estimate we get USD 2,628 million, or only 0.5% growth in export in January-November this year compared to last. Before the November figures were included, export looked set to grow five percent this year. Also the import and the total trade turnover dropped in November. Georgia’s foreign trade turnover in the eleven first months of 2014 is projected to have grown seven percent compared to last year, while before November’s figures were included, the growth was ten percent. The foreign trade turnover in January-November 2014 was USD 10,359 million. When it comes import, which amounted to USD 7,731 million in the measured period, the estimate is now nine percent, compared to eleven percent before the November figures were included. The negative trade balance in January through November was USD 5,103 million, which is 49 percent of the entire foreign trade turnover. The trade deficit in the same period in 2013 was USD 4,455 million. Precise data will be published December 24.